The “Ber” months is already here and the cold season is approaching. And who can resist this Pinoy favorite wanton mami that is piping hot and delicious! You can sometimes burn your tongue or mouth sipping this tasty comfort soup if you are not careful. Like what happened to me last time when I was in a hurry I thought it was not that hot. But it is not wanton mami I ate that time but a kind of shabu-shabu or hot pot that was cooked in a convection stove and served right away. Anyway, I’m just wondering when you happen to search the internet you will not find wanton mami on the Google search result but most of sites listed are wonton noodles. And as far as I know the word ‘wanton’ has a different meaning not related to food. I think “wanton mami” is distinctly a Pinoy or Chinoy term and I can also see this term in some Chowking branch on their menu. Ok enough of the trivia just enjoy cooking and eating! Hi, very interesting dish and tasty too. I’ll cook this within this week for my hubby! Thanks! 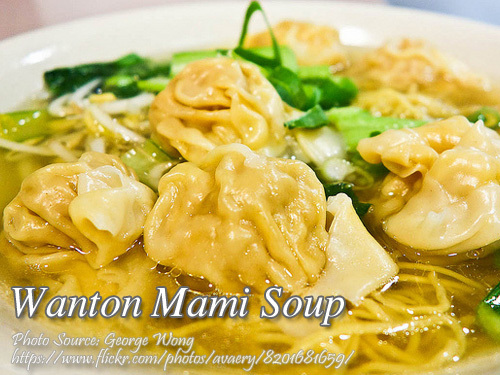 Hi Karen, thanks for sharing your insights and I’m sure you will love this wanton mami soup! Hello po, thank you po sa mga dishes na sineshare nyo, ang dami ko na pong recipe na nailuto na.itatry ko pong lutin ngayun ang wanton mami. More power po sa inyo, God bless po! Hi Marilyn, Maraming salamat din sa iyo at sa pag share mo ng experience sa recipe blog na ito!